Stephen Hannock, A Recent History of Art in Southern California (Mass MoCA #165), 1998-2012. Polished mixed media on canvas, 96 x 240 in. Photo: © Stephen Hannock, courtesy Marlborough Gallery, New York. NEW YORK, NY.- Marlborough Gallery announced the opening of an exhibition of Stephen Hannocks recent paintings. The exhibition will continue until June 2. In addition to large-scale paintings, the exhibition also includes a room documenting Hannocks process. Hannock, born in Albany, New York in 1951, lives and works in Williamstown, Massachusetts, and New York. Stephen Hannock began his career as an apprentice to Leonard Baskin (1922-2000) while studying art on exchange at Smith College. Early mentors also included the Massachusetts curators and art historians Elizabeth and Agnes Mongan of the Smith College Museum of Art and the Fogg Art Museum, respectively. After developing a novel technique using unstable phosphorescent acrylic paints in the 1970s to explore illuminative effects, in the early 1980s Hannock moved to Manhattan and fully engaged with the downtown contemporary art scene. Landscape has since been his predominant motif, coupled with an evolving mastery of technique resulting in pictures that appear to glow from within. Hannocks first comprehensive exhibition in New York in seven years, Recent Paintings: Vistas with Text features four new paintings of polished mixed media on canvas. All bear his signature, novel technique of working with acrylics, resin, pasted papers and photographs, specialized brushes, and power sanders to produce light effects unrivaled in painting. Hannocks approach, explicated in the exhibitions Process Room, involves layering subtly modulated acrylic paint across canvases, repeated polishing with sanders, and veneers of reflective resin burnished to a matte sheen allowing light to penetrate the stratum of the picture and reflect back with exceptional illumination. Pasted materials are fixed in the layers in the tradition of papiers collés, a method employed by Picasso and Braque. The pictures are also covered with handwritten textcomments on locations imaged, giving histories either personal to the artist or relevant to the sites. Hannock works these lines of text, which are not preconceived, into the topography of the image. The Oxbow: For Lane Faison with Betty and Agnes Mongan (Mass MoCA #147), 2011 (6 x 9 feet) and Northern City Renaissance, Mauve Dawn (Mass MoCA #161), 2012 (8 x 12 feet) reprise in new form the themes the artist has worked with before and represent great ambition and confidence in his unique technique. His signature composition, the Oxbow, a formation in the Connecticut River near Northampton, Massachusetts and a subject of fascination for artists in the United States for 170 years, epitomizes the complete unity of paint, text, and media in his new work. Northern City Renaissance is a winged view above Newcastle in northeast England, and an exploration of the regions rich history, sublimely aglow. Two new compositions, A Recent History of Art in Southern California (Mass MoCA #165), 1998-2012, and Moving Water for Frank Moore; Niagara Falls (Mass MoCA #170), 2004-2012, each eight feet high by twenty feet wide, are Hannocks largest works to date. To an unprecedented degree they fulfill the panoramic scope and cinematic associations of his landscape work. In the former, the prospect south from above the Stone Canyon Reservoir encompassing West Hollywood to the left, Beverly Hills and Century City in the central distance, and Santa Monica and beyond to the right, inverts the famous upward seeking view of the Hollywood sign in the hills, revealing a grand vista of the Los Angeles basin. 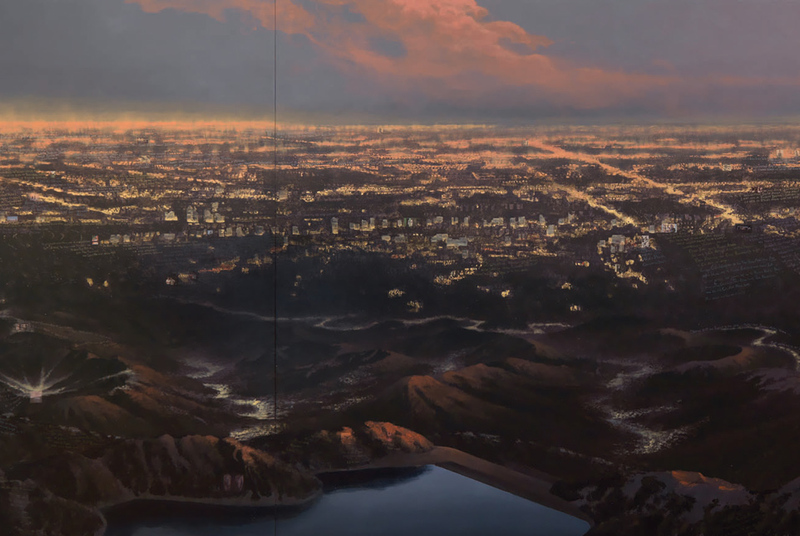 As the pasted materials and text make clear, the painting forms a survey of the LA post-war scene and a vision of the LA plain. It warps space and time: in reality the view is not totally comprehensible from this spot, and it encompasses overlapping artistic periods and sites of activities. The Niagara painting incorporates a setting artists favored since the Hudson River School, and a low and wide composition appropriate for the natural wonders breadth. Hannocks chosen perspective is an uncommon and dramatic one from the United States side, with the American Falls to the left, then the narrower Bridal Veil Falls, and in the distance on the right, the more familiar Horseshoe Falls, the section that prevails in the popular imagination. The Process Room includes notebooks and studies for these large pictures, equipment central to Hannocks work in his studio, multi-media displays that reveal his approach, and early work displaying the evolution of his present style. Hannocks work is found in public collections throughout the United States, including the Metropolitan Museum of Art, the National Gallery of Art, the Whitney Museum of Art, the Boston Museum of Fine Arts, the Museum of Contemporary Art, San Diego, the Smithsonian American Art Museum, the Museum of Fine Arts, Houston, and numerous other collections. Freemans to sell historic USS Constitution colors from the Collection of H. Richard Dietrich, Jr.